This healthy appetizer....It all started with a container of fresh feta cheese from the farm market. Life changing feta cheese. It wasn't sharp or overly salty. It was smooth tasting and a little tangy. And I needed a vessel to transport said feta to my body (besides the route of fork to container to mouth). 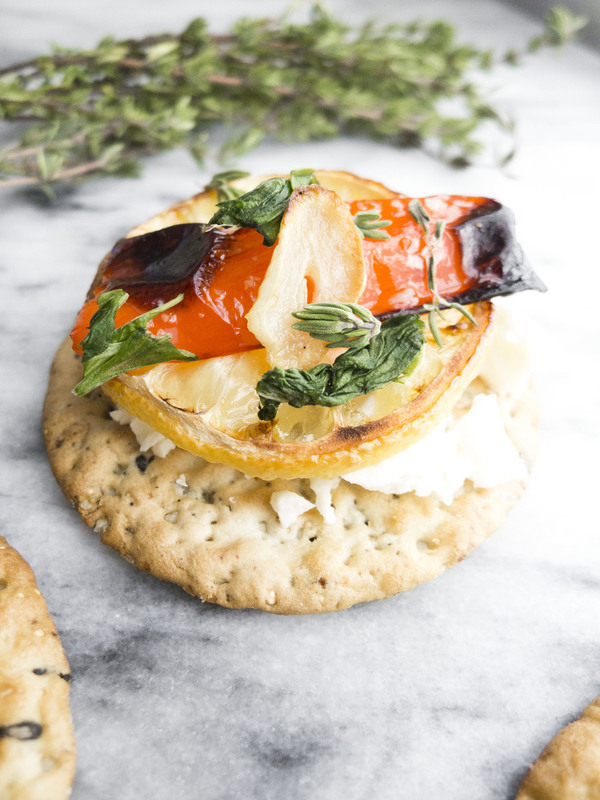 This appetizer is ridiculously simple to put together and takes advantage of a sturdy multi grain cracker, fresh herbs and lots of roasting. These crackers are Ancient Grain crackers from Costco. They are silly good and provide a sturdy platform for layering. Next up is the feta. And on top of that is a roasted lemon that becomes sweet with roasting and a pepper that is full of warming but bright flavors. Sprinkled with thyme and basil you get some great green and earthy herbal notes...but the best? The garlic chip. GARLIC! Don't be afraid. It turns sweet and perfect. /// Directions /// Remove top of peppers and de-seed. Cut in half and create slits so the pepper will lay flat on the roasting pan. Top with olive oil. Slice lemons thinly and place on same roasting pan. Slice garlic thinly and top with olive oil. Roast at 350 F until the lemons begin to brown and peppers start to soften and the garlic begins to crisp. Switch oven to broil until peppers begin to blacken. 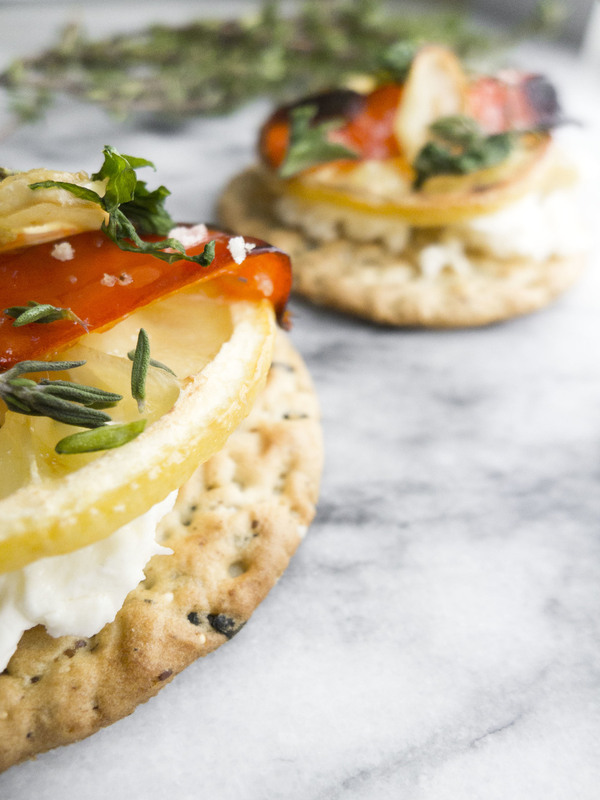 Layer each cracker with crumbled feta, lemon, pepper, herbs and garlic chip.